Joe Ingles helped give Landon Carter the gift of sight. On Thursday, the boy saw the Jazz beat the Suns. Jazz forward gave Carter $10,000 goggles that has helped him see despite being born legally blind. (Chris Detrick | The Salt Lake Tribune) Landon Carter, 8, watches the Utah Jazz play Phoenix Suns at Vivint Smart Home Arena Thursday, March 15, 2018. For the first time in his life, Landon Carter was able to watch a live basketball game. But he has been seeing so much more than that lately, thanks to Utah Jazz forward Joe Ingles. Imagine being born without irises like Carter was, a condition known as aniridia syndrome. He can focus on images that are 6 inches in front of his face, but the rest of the world is a blur. For the first eight years of his life, Carter lived in Utah without seeing a mountain. He couldn’t watch basketball unless the screen was directly in front of him. Carter has been given the ability to see with electronic glasses made by eSight, which have high-definition cameras that capture images and broadcast them on LED screens that bring the pictures he’s never seen to where he can see them. Previously, Carter had made headlines for wearing the glasses to a Jazz game in April, having spent all previous Jazz games playing on his father’s phone. 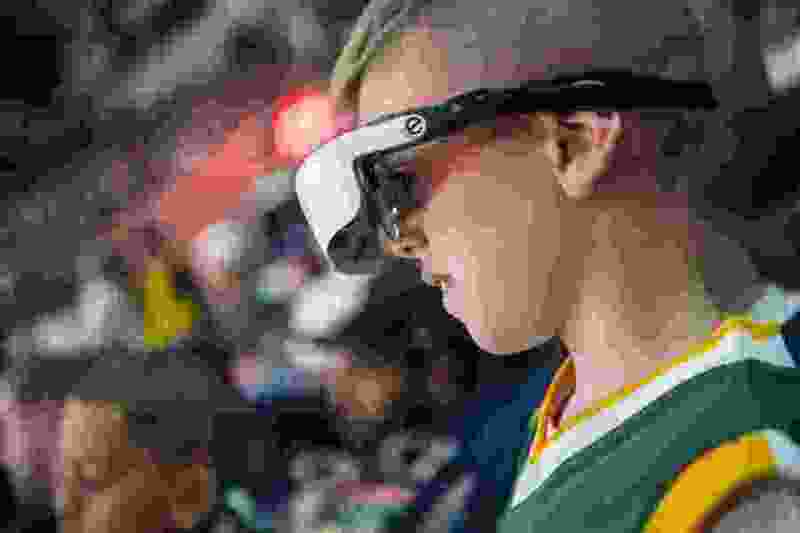 When his dad, Jeff Carter, asked the Jazz if they had any devices for the visually impaired, the Jazz bought goggles for fans to use when they come to games. Landon saw his first live basketball game last season through his glasses, and they were a delight. But he still had to leave the glasses at the arena when he went home. Ingles decided to fix that, buying Landon his own personal pair for an estimated $10,000. The Jazz arranged a meet-and-greet with the Carters and Ingles last July, and Ingles dropped the glasses as a surprise. The family was floored — even more so when the Jazz forward spent the next hour of his time talking to Landon. Since then, the Carters have taken the glasses well outside the confines of the arena — the outdoors, the movies, museums. Now with the ability to see the world beyond his reach, there’s always something else to look at. That included Thursday’s game, when the Jazz played the Phoenix Suns. Carter was invited down to the floor to talk with Ingles on the bench as the Jazz warmed up. The two talked for 15 minutes. Hugs and high-fives were exchanged. 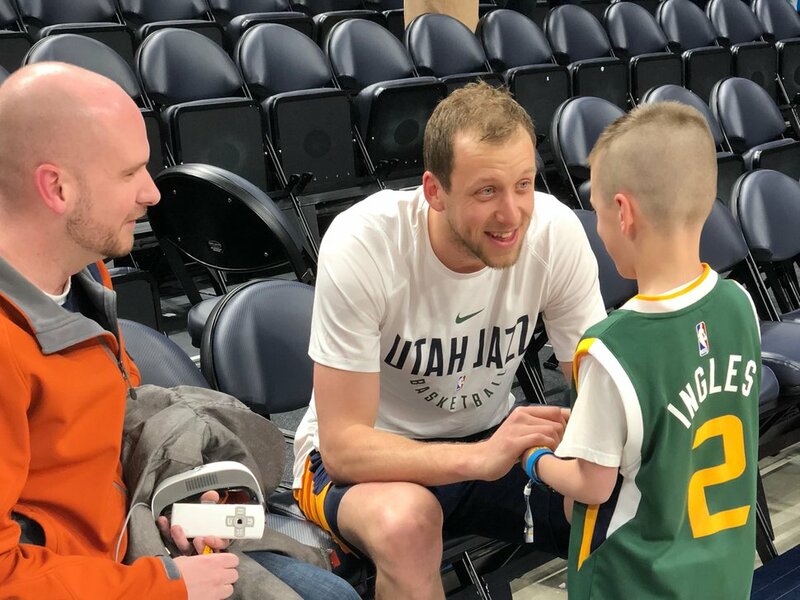 Joe Ingles chats pregame with Landon Carter, an 8-year-old fan. Ingles gifted Carter, who is legally blind, a $10,000 pair of goggles from eSight that allows him to see high-definition images of the world around him. Along with his father, Jeff Carter, Landon watched the game in the crowd at Vivint Smart Home Arena on March 15, 2018. Photo by Angela Treasure. Courtesy of the Utah Jazz. The Carters sat in the front row of the upper bowl because the technology works better when he doesn’t have to move his head drastically. When Landon wants to take occasional breaks, his father puts the glasses in a special hard-cover case — after all, this is among the family’s most treasured possessions. He was able to see when his favorite player hit Utah’s first 3-pointer of the game. Ingles would finish with 17 points in the 116-88 win, which was in part dedicated to the boy proudly wearing his jersey up in the stands. And most important, Landon saw it happen.